THIS POST IS NOW OUTDATED. The Auvi-Q has returned in ownership to its original inventors and their company, kaléo. An updated post will be published. (This information pertains to patients in the U.S.A. and is presented to the best of my knowledge. Problem: I am having trouble getting my Auvi-Q prescription covered by my insurance company. If you have another prescription provider, you should still be able to use this form. Sanofi's Patient Connection site has other forms that might also be useful for appeals, etc. Want some even better news? As of 1/1/2015, the Auvi-Q will return to the Express-Scripts Formulary, as a "Tier 2" medication, meaning it should be covered by most insurance plans! They were finally able to overcome the exclusivity contract brokered by another epinephrine manufacturer, and now freedom of choice has been restored to families in search of epinephrine! This change has already taken place with Caremark, as of 7/1/2014. (Updated to add: As of 1/1/2015, the Auvi-Q will also return to Tier 2 status for those covered by Aetna Value and Aetna Premium insurance plans!) If you use another prescription provider, contact them to let them know that you want the freedom to choose the life-saving device that you feel best suits your family's needs. Problem: I was able to obtain a prescription for my Auvi-Q, but the set(s) I received from the pharmacy expire(s) in less than 12 months! Solution: Fear not! 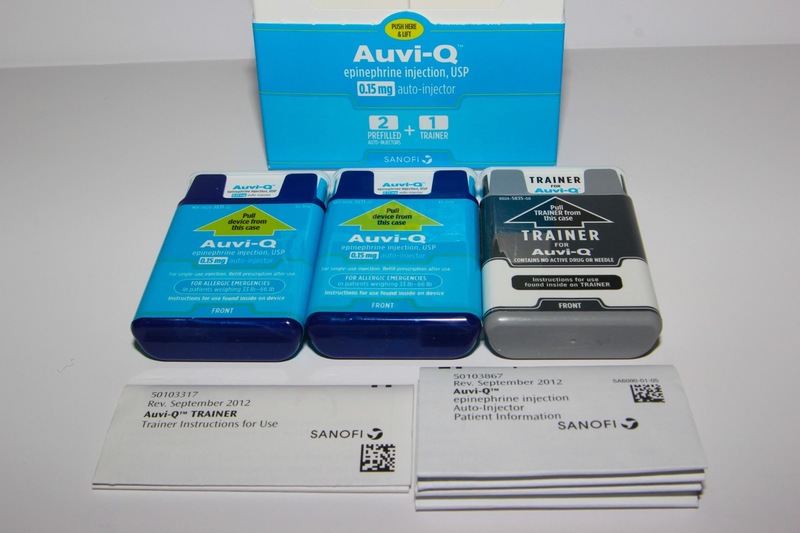 Sanofi, makers of Auvi-Q, are offering a generous resolution to this issue. Oh Mah Deehness posted this tidy summary of the information that Connie Green and a few of us received from Sanofi on the issue: "Patients or caregivers who, within the last 31 days, purchased an Auvi-Q that expires in less than 12 months are eligible to receive a savings card with a maximum benefit of $400 off one two-pack of Auvi-Q for each Auvi-Q purchase that meets the terms and conditions. Savings cards are valid for use January 1 – June 30, 2015. 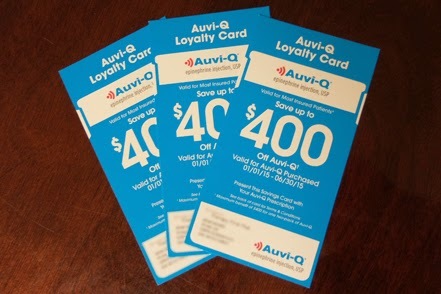 Patients or caregivers who purchased an Auvi-Q in the past 31 days with 6 months or less of dating may receive a replacement Auvi-Q or they can opt to receive a savings card. For more information, including terms and conditions, patients or caregivers should call Sanofi Customer Service at 1-800-633-1610." (If that number doesn't work, you can also try 1-800-207-8049, Option #5 and then Option #1. Thanks for the tip, Julie Brown!) Note: "In the past 31 days" means that you need to submit your request within 31 days of your invoice date, not within 31 days of the blog post. Problem: I use Express-Scripts mail order and they will not accept my Auvi-Q $0 co-pay card! Solution: Express-Scripts states that they have no way to accept co-pay cards for auto-injectors purchased via mail order. To get the co-pay back, you must submit a request to Sanofi for reimbursement. The 11-digit ID# and GRP# that is found on the Auvi-Q card or a photocopy of the card. Patient name, mailing address, city, state, zip, phone number, DOB, and the out of pocket payment. For minors, provide the return mailing address as "[Child Name] c/o [Parent Name]"
Note: The process remains the same for 2015. Submissions for 2015 must be postmarked no later than 12/31/2015. Problem: I am unable to afford my (or my child(ren)'s) Auvi-Qs. Solution: Epinephrine is a potentially life-saving medication and no family at risk for anaphylaxis should have to forego it, during times of financial hardship. The Sanofi Patient Connection site has information and a form for the Patient Assistance Program. Some may be surprised to learn that they qualify for assistance under this program. The form includes a complete list of requirements, but, for example, the income requirement for a family of four is that it be under $59,625. (This is 250% of the U.S. poverty level at the time of this writing.) It's worth looking into, if financial strain is an issue. Those at risk for anaphylaxis, and those who care for them, must have epinephrine on hand, at all times and they should have at least 2 doses. Please do not let anything or anyone stand in your way of getting what you need to protect yourself or your loved ones. Disclaimer: I am not a doctor, nor a medical professional. Always consult with a doctor before making any healthcare decisions. This is not a paid post. A year ago, I attended a summit at the Auvi-Q headquarters, along with other bloggers, as invited guests with expenses paid, to see the Auvi-Q before its launch. We were never, and are not currently, under any obligation to write about or promote the Auvi-Q. Disclosure: I was once an invited guest, along with several other bloggers, to the Sanofi HQ, to preview the Auvi-Q®, before its initial release. I am under no obligation to write about the Auvi-Q®, nor am I obligated to write anything favorable. My opinions are always my own and I write about things that I truly believe in and trust. I am not a medical professional. 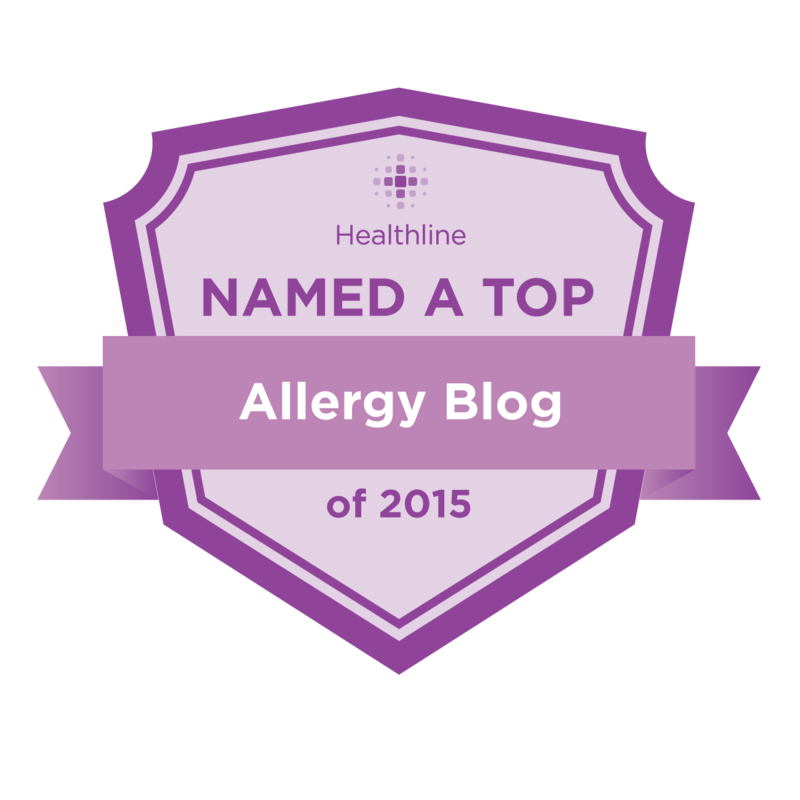 Always consult with a board-certified allergist about issues relating to anaphylaxis and food allergies. These videos include interviews with parents who have actually used the Auvi-Q®, along with the inventors of the Auvi-Q®, Evan and Eric Edwards, who both grew up with anaphylactic food allergies. One particular item I would like to recommend is the Auvi-Q Mobile App. It can act as a training device, on -the-go, and I love how it senses the change in position of your phone to simulate the use of the device. It also has a training module in Spanish. The voice instructions are still in English, but the written guides are in Spanish, to help Spanish-speaking caregivers/patients. There are several other great features on the app, so be sure to check it out! Good luck with your Back-to-School planning! Note: For those who have received Auvi-Q® prescriptions from your pharmacists, in the past 31 days, with expiration dates earlier than 12 months in the future, there is good news! Please head on over to Oh Mah Deehness! to view Homa's post on contacting Sanofi to receive a $400 voucher towards the purchase of replacement devices, for when the short-dated devices expire. These vouchers are valid from 1/1/2015 - 6/30/2015. I completed this process, this morning, in under 10 minutes! As for those who, like me, have been lamenting the difficulties in obtaining coverage for the Auvi-Q® from certain prescription providers, such as Express-Scripts, from whom we obtain our medications, there is some hope on that front, as well. Your allergist/doctor can contact Express-Script's Prior Authorization line and request a Clinical Exemption, under certain circumstances. Sanofi also has forms available on their Patient Connection site, which you can use for other providers, or if more than a doctor's phone call is required.